St John Ambulance members from across Derbyshire put their skills to the test last weekend in a bid to become county champions. 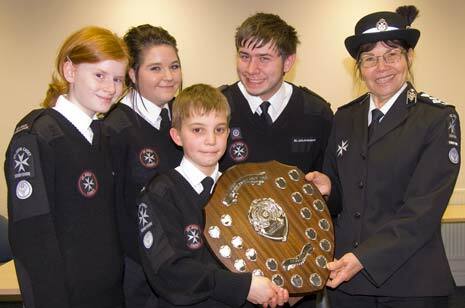 The triumphant Walton/TI Cadets team (from left) - Bethany Cook, Sophie McArdle, Sam Cree and Keelan Rushby - receive their trophy from Dr Cheryle Berry, head of St John Ambulance Derbyshire. The competition not only decided which teams were top in the county, but also which would go on to represent Derbyshire in the regional event. First aiders of all ages were faced with a variety of realistic scenarios as part of the annual event at County Headquarters in Chesterfield. Winners will now go on to represent Derbyshire at the regional competitions to be held in Northampton in May. Winner of the Cadets' title was a combined team from Walton and TI Chesterfield Divisions, who triumphed over their nearest rivals by a clear 60 points. 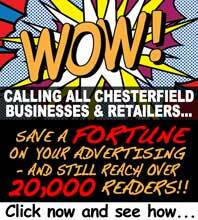 There were only four points separating the top adult contenders, with Chesterfield B team just clinching victory, while honours in the Badgers' competition (for under-tens) went to Pleasley. Clive Dennis, Commissioner Operations for St John Ambulance Derbyshire, said: "Competing is the best form of training for first aid. The realistic situations test the skills and knowledge of the teams and also offer an opportunity to represent their county at a regional and national level." Carl Makins, Principle Youth Officer, added: "Competitions are a good way of involving young people, allowing them to demonstrate the skills and knowledge they have gained while volunteering with St John Ambulance."